Hello again! It's time for the long-awaited review of the Giant Mouth-Creature! I would have done this thang this past weekend but was involved in a series of celebrations of my great-grandmother's 100th birthday - highly JOHN APPROVED. I've got to say: this is pretty weak. 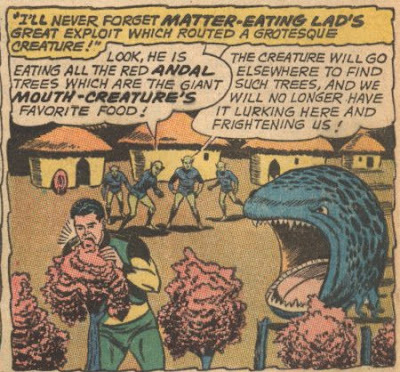 I mean, Matter-Eater Lad is my very favourite Legionnaire, but there's a heck of a lot wrong with this situation. First off: what the hell kind of wimps are these aliens? They have this critter lurking around their village, eating trees - not star basketball players, not baby-sitters: trees - and they're so scared of it's wide-mouthed herbivorousness that they have to call in a special guy to eat the trees for them. I was going to wonder why they didn't just kill the Mouth-Creature if it gave them the willies so bad, but I think I just answered my own question: it's because they can't even defeat a tree, let alone an omnivorous-at-worst sphere with lockjaw that doesn't do much more than glare when some dude just waltzes in and eats up it's bedtime snack. I wonder: if M-E Lad takes too long to do the job will they become frightened of him? Do they accuse people sitting next to them on the astro-bus of "Lurking there and frightening me"? Bah. Bah, I say. The creature itself? Kind of awesome. I can't decide whether I want it to be able to close its mouth or not, but even if it's a permanent thing, that's a fantastic expression of impotent rage that it's wearing as it watches Tenzil snack. Also, those little rubbery legs are great. Again, how could you be frightened of this thing? It looks like something that you could tip over and use as a planter, without calling in Element Lad to adjust the soil's pH or anything. Heck, you could even get all ironic and use it to grow some Red Andal trees in, if you're that sort of person.